Facebook groups are closed (or open) spaces where one or more administrators are given greater control over the content than on a Facebook page. It’s where people get together around areas of interest such as the place you live, pot plants, football, politics or an issue where people try to influence each other. Virtually anything be found in groups. The reason for using them is partly due to the focus of the conversation but also because the limited access to the forum makes it possible to converse ‘undisturbed’ or more openly about the topic. 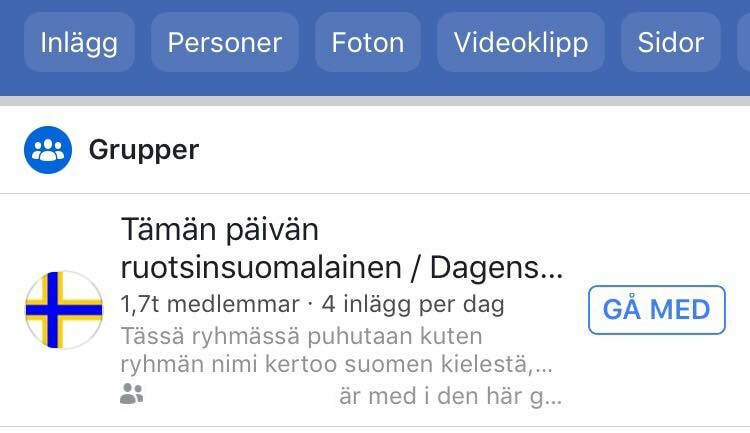 There are other forums with similar functions but Facebook is the biggest and according to the latest version of Swedes and the Internet (Svenskarna och internet, 2017), a large survey of internet behaviour and habits in Sweden, 60 per cent of Swedish Facebook users are members of Facebook groups. The dark social trend also indicates that this behaviour is becoming increasingly common and since spring 2018, Facebook gives precedence to content from groups in the News Feed. 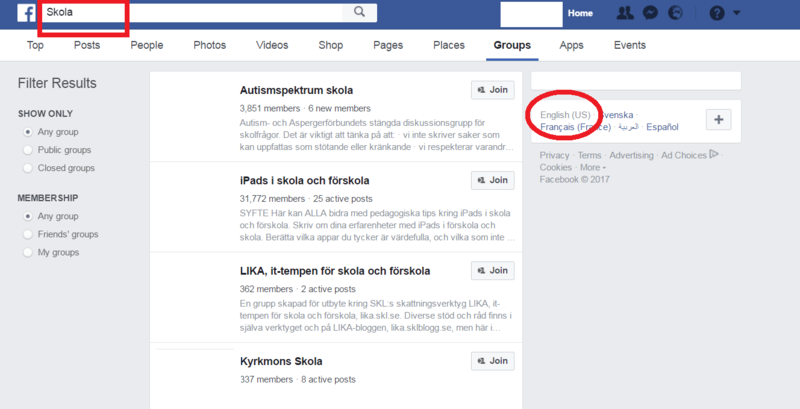 Facebook group about the finnish language in Sweden, with 1 700 members. While some groups are closed or even secret, many allow you to read their posts even if you are not a member. This means opportunities for journalists. By learning how the groups function, and by making overtures to them and their members in the right way, in both the short and long term, we can easily find people to interview or ideas for new journalism. ​Reading about the issues affecting minority groups and about their everyday lives can make it easier to find ways to reflect their reality from the "inside." All groups have one or more administrators who keep order and decide the rules, some quite strict, others less so. Often the rules are written into the group description so that you can read them yourself. 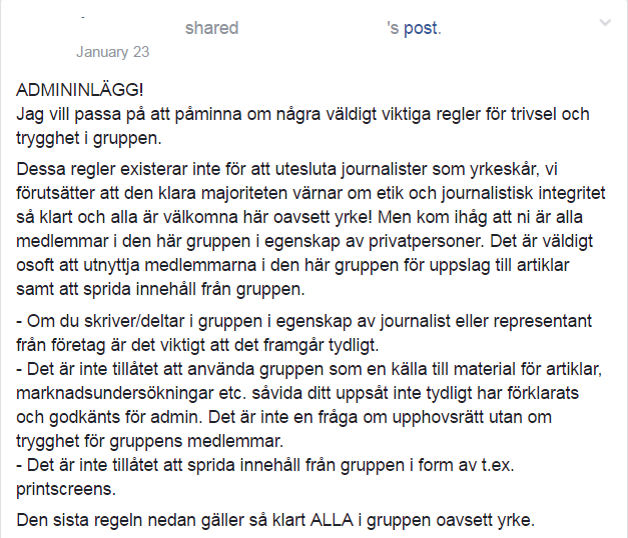 If you want to join a Facebook group, whether it is open, closed or secret, it’s always a good idea to contact the group’s admin to describe what you intend to do and check if they agree to your participation for journalism purposes. You find the admins under the Members tab. Remember! Going into a group as a journalist without introducing yourself as such could easily lead to irritation or that you are simply kicked out. The example below shows an admin’s post written after the group members discovered that they had been quoted in a journalistic text without having been asked first. Facebook groups do not exist for you as a journalist to plunder. They exist for the active users in the group. Whatever you do in the group, do it with respect. Why would you like to join the group? Have this clear in your mind so you can quickly explain it if anyone in the group asks you why you are there as a journalist. Count on getting questions. What are the group’s rules? Even open groups have rules that are important for you to respect. If you have any doubt at all, you should ask an admin. How do you intend to participate in the group? Do you intend to participate actively or mostly listen? If you participate and become part of a community, you will probably get more out of your presence in the group. But in many groups, especially bigger ones, it might be quite okay to just be there and listen. But consider that you can’t necessarily all of a sudden become an active member and start distributing your material for example. This will be experienced as you arriving at a party in someone’s home, cranking up the volume on the TV and then leaving again. Think about what the best way to behave is without anyone objecting. If you are new to the group, try to work out its patterns in order to understand the community. What can you contribute to the group? Working with social media is about both give and take. If you want something from the group, it’s a good idea if you are prepared to bring something to the table yourself. To contribute to the debate, perhaps by posting interesting links – or perhaps by taking up the group’s issues in your journalism. But then you should be clear about not taking sides. What will you do with the group after your coverage? When you are finished with your report, your news coverage or programme feature, what do you intend to do with the group? If you have generated journalism that you have linked to there, make sure that you take responsibility for any subsequent discussion as far as possible – naturally it is up to the admins to determine the boundaries for comments, but you should nonetheless be there to respond to the extent that it is reasonable to do so. What will you do if you cause a crisis? If your material or participation creates problems in the group, what will you do? Think this through, particularly where the issues you are covering are sensitive, or where the group has a history of storms of comments in relation to these issues. Be prepared to participate in solving the problems, preferably in consultation with the admins. Take responsibility by responding to questions, criticism and reflections. Facebook is the biggest social media platform, with millions of users in Sweden. This means that you can find interest and activist groups for almost everything there. That’s a large amount of material to search through. If you’re intending to find people to interview or ideas for coverage, often the easiest way to start is to use simple keywords directly in the Search box. Go to your Settings and choose Language: US English for better search results. Search term "school". Choose language "English (US)" for more accurate search results. ​It’s easy to find a list of admins and members in a group and a description of the group’s aims and purpose, and often also a list of rules for the group. Screenshot from the facebook group "iPad use in school and pre-school". 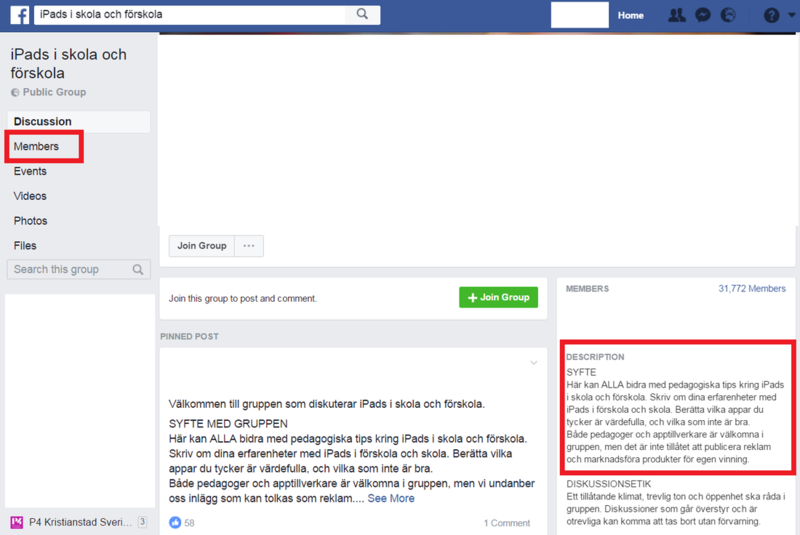 ​In the group’s search box, you can then search for what you are looking for, such as posts from this group's 31,772 members who live in Karlskrona. ​Working with your own newsroom/department Facebook groups can be a great way to build communities. In a similar way to the way people in general form communities around an area of interest or a political issue, a newsroom/department Facebook group can be a hub for an informed and interested portion of your audience. Here are some examples. Knowledge-based groups. An arts department (with coverage areas such as film, theatre, music and visual art) or a science department (climate and the environment, technology and medicine) can get closer to their audiences by providing a platform where the audience can also contribute in a way that is different (for example by publishing their own posts in the group) from the open comments fields on a Facebook page. Success with your own groups is based on the newsroom/department offering a particularly interested audience something they won’t find elsewhere, which often means journalists with specialist knowledge who moderate the group, initiate discussions and answer questions. Groups based on a common interest. A common feature of group behaviour on Facebook is coming together around the place where you live and discussing what is happening in your immediate surroundings. Some local press are already doing this, for example in spring 2018, Dalarnas Tidningar (swedish local newspaper) started two groups of their own: Talking about Avesta and Talking about Mora, with good results in a short time, especially in the Avesta group, which is more user-driven. Groups for sensitive subjects. A closed or secret Facebook group can be a tool to delve deeper into a subject that is more difficult to speak openly about, for example, patient questions of various kinds. This requires more of the newsroom/department when it comes to discretion and sensitivity. Don’t forget about source protection, and avoid handling sensitive information or contacts with anonymous informants via social media messaging functions (for example, Facebook Messenger). Learn more about digital source protection here. If the group should be open or closed. If the issue or the subject matter requires undisturbed conversation or a more inclusive approach, it may be a good idea to close the group and accept members by invitation or an active departmental decision to admit new members. Is the group primarily user-driven, or as moderator do you drive the content? Find a level that both your department and the group members are comfortable with. 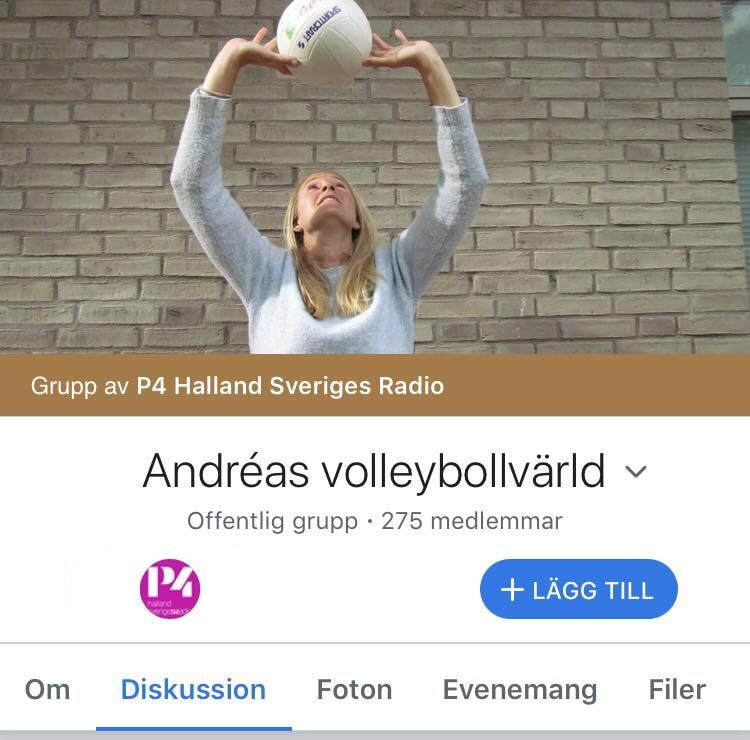 ​In spring 2018, P4 Halland (one of Sveriges Radio's local radio stations, based in Halmstad) started its own Facebook group Andréa’s world of volleyball. In this group, the discussion is very much based on blog posts by the newsroom’s volleyball expert Andréa Jacobsson, who also moderates the comments fields, with the support of the newsroom.